Home appliances are electrical or mechanical machines that accomplish some household functions, such as cooling, heating, cooking, or cleaning. Appliances in your house help add a touch of convenience and comfort. Be it an Oven, Free Standing Cooker, Stove, Dishwasher, refrigerator, microwave, washing machine, Dryer etc., you cannot even imagine to survive a single day without them and if one of these appliances does not function normally, your daily chores of work get disturbed and causes huge inconvenience. In the modern times, every individual has become highly tech-aficionados and home appliances of different brands form an integral part of your living. Right from the Oven, Free Standing Cooker, Stove, Dishwasher, Refrigerator, Washing machine, Dryer to Microwave ovens all are your daily assistants in making life easier. Life without these home appliances is literally unimaginable. So, as the household appliances play such a vital role in your life so it is extremely important that they keep on performing smoothly as a breakdown in their performance means a heavy difficulty in managing your daily chores of life. In order to keep the home appliance function properly it is essential that you maintain the appliances on a regular basis. However, despite of proper maintenance, the performance of the home appliances slow down, maybe because of aging or some other fault. In such situations, the first thing you need is to take help or assistance of a home appliance repair professional. You just need to pickup the phone and call upon your local home appliance repair service provider immediately to repair your malfunctioning household appliance efficiently. But before calling a local home appliance repairing service provider, you need to have some information about such a company. 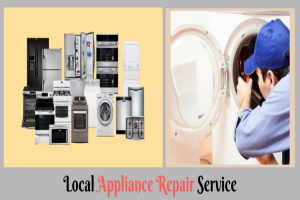 Most of the times, people do not know which is the best local appliance repairs & service provider in their area from whom they expect a high-quality oven, stove, washing machine, dishwasher, refrigerator, etc., repairs & services at affordable rates. So, what do you do in such a situation? Well! If you are in such a situation, then you may seek help of the online resources. These days, getting relevant information about a particular service provider has become immensely easier with the help of the internet. Moreover, these days, most of the companies have their official websites that enable people in getting information about their services and the brands they deal with, quite conveniently. Appliance Repair Vs Replacement: Which Is More Reliable? Household appliances are the cornerstones of modern life. Without these trusty devices, people will face difficulties like washing clothes by hand, cooking meals over an open fire, and many more. It is no wonder that a broken appliance can amount to a pretty big problem in most households, and the question of whether to repair or replace these devices can even create a lot of anxiety. When it is about fixing household appliances, every device eventually reaches a point of diminishing returns. If it is cheaper to fix an appliance than replacing it, the smart money spent is usually on the fix. However, it does not make sense to fix a device that is likely to break down again in the near future or become technologically obsolete. Mainly It is important for the repairs to be cost effective. Age: The age of an appliance needs to be considered when deciding whether to repair or replace. Most appliances have an average life span and once an appliance passes that point, it is usually a good idea to replace it. Antiques and some high-end appliances are the exceptions to the rule, as they may be extremely expensive to replace. Warranty: Determine if your appliance is under warranty, because you might be able to have it repaired at a reduced rate or free of charge. Warranties are important because replacement parts are expensive and can even cost more than the cost of purchasing a new appliance. Make sure that your appliance is out of warranty before approaching a repair company. The appliance is expensive and therefore worth fixing. There are many factors, consumers require to consider before hiring an appliance repair company. Home appliances tend to be very expensive so it is essential to ensure that the appliance repair company you hire is reputable and has the skills needed to complete the fix in a timely and efficient manner. Local Company: When you hire a professional to repair your household appliances, it is essential on your end that you appoint a local home appliance repairs & service provider. Locality matters a lot when hiring a home appliance repair professional. It is helpful to hire a local appliance professional as they will be available at your service whenever needed. Inquire about the Costs: Get to know about the costs of the home appliance repair company to know whether it is affordable to hire the company or not. There are some notable home appliance repairs & service providers that offer competent oven repairs, stove repairs, washing machine repairs, refrigerator repairs in Sydney. One such notable repair company is ‘Local Appliance Repairs’ in Sydney. They offer competent home appliance repairs at immensely affordable prices. Their repair technicians are highly experienced extremely competent and offer highly reliable services. Check Skill Level: It is important to hire a company whose employees have the training to complete the job flawlessly. Ask if the employees or technicians are factory trained or certified in appliance repair. The technicians of ‘Local Appliance Repairs in Sydney’ are excellent with regards to household appliance repair jobs. Know if the Work in Under Warranty: Check to see if the repair service guarantees its work and determine how long. Most warranties vary from 90 days to one year. Worried about home appliance repairs!! No Worries!! Seek help from the recognized home appliance repair companies!!! By farrokh| 2017-12-13T13:41:27+00:00	November 15th, 2017|Appliance Repairs|Comments Off on Local Home Appliance Repairs Service – Know How the Household Appliance Repair Professionals of Sydney Can Help! !